We would love to hear from you! Please fill out this quick form and we will be in touch with you shortly. Or, call us at 1-844-265-1278 (TDD/TTY 1-855-742-0123). If you are an Ambetter member you can reach us 24/7 through your online member account. If you don’t have your account yet, setting it up is quick and easy – get started now! You can also reach us from 8am-8pm EST at 1-844-265-1278 (TDD/TTY 1-855-742-0123). 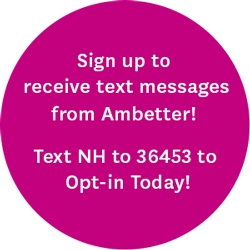 Disclaimer: This form will send your message to Ambetter from NH Healthy Families as an email. The email is not encrypted and is not transmitted in a secured format. By communicating with Ambetter from NH Healthy Families through email, you accept associated risks. Ambetter from NH Healthy Families does not accept responsibility or liability for any loss or damage arising from the use of email. To ensure the safety of your PHI, please send us a message through the Secure Member or Provider portal.